New year, new life, new look. I hope you have all had a nice holiday. It is time now to go back to normal and to think of the future. 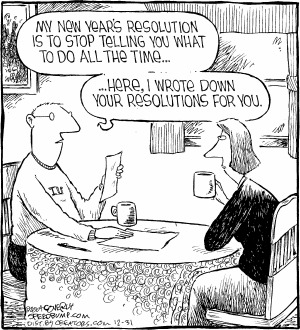 Many people have the habit of writing plans for the future when a new year begins, our New Year’s Resolutions. This is what we’ll talk about this afternoon, for this we’ll listen to 6 Minute English, and we’ll try to follow Richard Wiseman’s advice to succeed in our improvement plans.